Make sure you have correctly integrated the ironSource Adobe Air Plugin. Integration is outlined here. //Invoked when the RewardedVideo ad view has opened. //tasks till the video ad will be closed. //Invoked when the RewardedVideo ad view is about to be closed. //Your activity will now regain its focus. //Invoked when there is a change in the ad availability status. //You can then show the video by calling showRewardedVideo(). //Value will change to false when no videos are available. //Invoked when the video ad starts playing. //Invoked when the video ad finishes playing. //Invoked when the user completed the video and should be rewarded. //the callback from the ironSource server. See the complete description of the ironSource error codes here. With ironSource’s Ad Placements, you can customize and optimize the Rewarded Video experience. This tool enables you to present videos to your users from different placements depending on the reward. You can use the below function to define the exact Placement you’d like to show an ad from. Navigate to the Ad Placement document for more details. In addition to ironSource’s Ad Placements, you can now configure capping and pacing settings for selected placements. Capping and pacing improves the user experience in your app by limiting the amount of ads served within a defined timeframe. Read more about capping and pacing here. Note: If you choose to use the capping and pacing tool for Rewarded Video, we recommend calling the below method to verify if a certain placement has reached its ad limit. This is to ensure you don’t portray the Rewarded Video button when the placement has been capped or paced and thus will not serve the Video ad. The Dynamic UserID is a parameter to verify AdRewarded transactions and can be changed throughout the session. 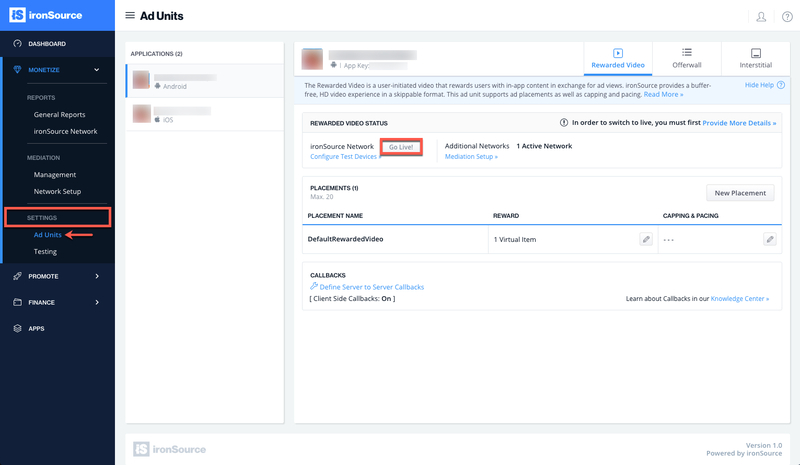 This parameter will be received through the server-to-server ad rewarded callbacks and must be set before calling showRewardedVideo. You will receive adynamicUserId parameter in the callback URL with the reward details. The ironSource SDK will fire the onRewardedVideoAdRewarded event each time the user successfully completes a video. The RewardedVideoListener will be in place to receive this event so you can reward the user successfully. Note: The onRewardedVideoAdRewarded and onRewardedVideoAdClosed events are asynchronous. Make sure to set up your listener to grant rewards even in cases where onRewardedVideoAdRewarded is fired after the onRewardedVideoAdClosed event. The default setting in your ironSource account is to notify you of user completions/rewards via the onRewardedVideoAdRewarded callback within the client of your app. Additionally, if you would also like to receive notifications to your back-end server, you can turn on server-to-server callbacks.